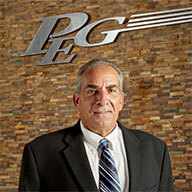 Mr. Anthony Mongone has more than 35 years of experience in large-scale commercial and residential plumbing, heating, and fire protection systems. Anthony prides himself on completing the most challenging and complex projects on time and on budget. Anthony founded Tradeline and still guides its day-to-day operations as a key operating unit of the PEG. His present responsibilities with the Company are wide-ranging and include preparing estimates and proposals, managing multiple projects simultaneously through completion, and drawing on his extensive knowledge of local building codes, licensing, permitting, and trade standards to complete inspections and related tasks.